The boat has a bowthruster tube installed but no unit. 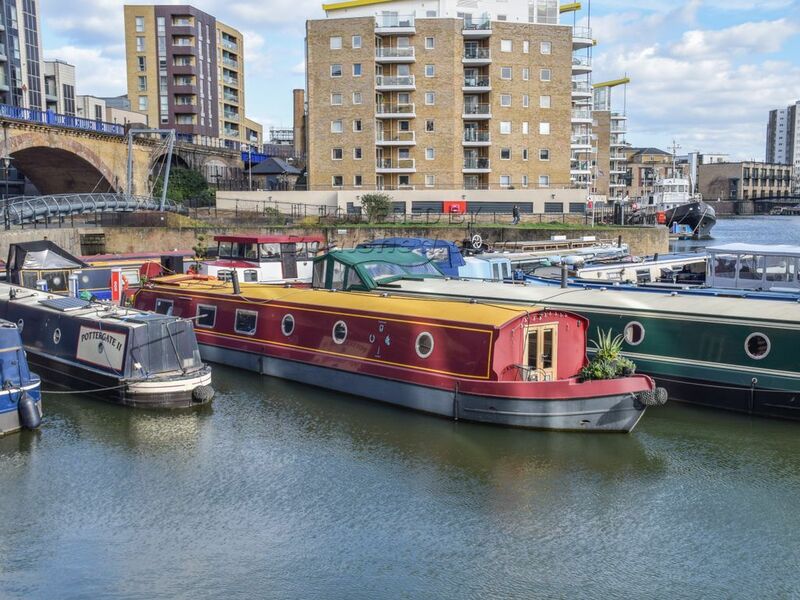 Boatshed London are delighted to offer this 60ft x 10ft Collingwood Wide Beam for sale with fully transferrable London residential mooring at Limehouse Basin. lightness of a more contemporary look, the interior finishes include oak flooring throughout and grooved painted panels to the ceiling and below the gunnels. Laid out in the reverse style, you enter from the large closed stern into the well-equipped, open-plan galley and living area. Bespoke cabinetry, granite countertops and built in oven, grill, combination microwave and gas hob make cooking a pleasure. Hook-ups for your Washer/Dryer and Dishwasher are provided for convenience. leading via French doors to the foredeck. This cabin is currently furnished with a king size bed but could equally be used as a large study or drawing room to complement the use of the smaller cabin as the sleeping compartment. The luxurious family sized bathroom mirrors the finish in the kitchen, with four cabinets, a very useful linen cupboard and granite worktops sitting very practically alongside a large glass shower compartment and Elsan head with a china bowl and electric flush. There is a multi-fuel stove and central heating. Hot water can be generated from the central heating unit or by electric immersion or by running the engine. All window units are double-glazed. The boat was epoxied at new. The large Canaline engine runs beautifully; unsurprising given its recent date, having delivered just 107 hours of service. The engine was last serviced in the summer of 2018. The boat is moored on the separate F pontoon at Limehouse basin which has a strong community feel and offers particularly convenient access to Limehouse DLR & C2C stations as well as a variety of bus routes. Canary Wharf is about 15 minutes walk to the east whilst a gym, cafe and supermarket are just a few feet away to the north. block, Elsan, mail delivery and secure parcel room. Newly installed bollards supply 32-amp A/C power, charged to an online account, which is fully controllable at distance. The marina offers free Wi-Fi to all berth-holders. Electric car charging facilities are being installed at the time of writing. Current mooring fees are approximately £11,680 per annum paid upfront, £12,600 paid monthly. This boat lies on a fully transferable residential mooring at the highly desirable Limehouse Marina (5% transfer fee). Being so new, this stylish boat is one you could move straight onto without needing to begin with repairs, alterations, blacking, etc. Viewing is highly recommended. Freestanding furniture is not included but may be negotiated. This Wide Beam 60ft With London Mooring has been personally photographed and viewed by Angus Rose of Boatshed London. Click here for contact details. Please note this comments section is public. Please do not post your personal details here. To enquire about purchasing this boat, please contact the broker directly at angusrose@boatshed.com. Please read our commenting guidelines before posting.